Want to see recent items on a per app basis? The Mac makes this easy with a variety of ways, but perhaps one of the most convenient involves a simple tap gesture. This is particularly fast and simple, and here’s how it works. You can quickly see any apps active windows and or recent items in Mac OS X with any modern MacOS release by using a two-fingered double-tap on that applications icon in the Dock. Try it out yourself, use two-fingers on a trackpad or Magic Mouse to double-tap on an apps icon in the Dock, make it an app that has file usage like Pages, TextEdit, Numbers, BBEdit, Photoshop, Pixelmator, or similar. This is a pretty simple trick but you’ll want to try it on the Dock icon of an app which you know has either currently active windows (like a web browser or Finder), or which has had files open recently (like Pages or TextEdit), then, just hover the cursor over the Dock icon in Mac OS X, and double-tap with two fingers. You’ll instantly see all open windows and, if applicable, the recent items opened in that app too. The open windows appear tiled at the top of the screen, whereas recent items appear as file icons near the bottom of the screen. 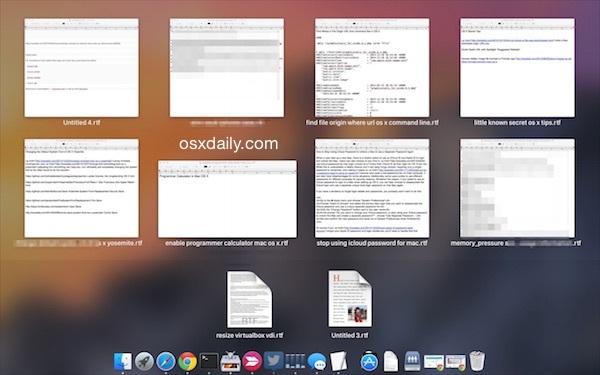 This works in all versions of MacOS and Mac OS X, bringing up a menu contained within Mission Control showing all of your recent items, and if you have currently opened items they will be displayed above the list. The trick also works on apps that are not currently open, allowing you to see recent items without launching that app. This tip was sent in by one of our readers, who cautions that you will also see recent items you may have forgotten about or don’t intend on being visible, something to keep in mind depending on what files were worked on! Thanks for the tip Nilesh! i guess it is the same as App Expose in any app which you have currently open, for me it is four fingers down. BTW your site rocks! The trick won’t work on my Mac Pro with a Magic mouse. Can you, or anyone confirm this works on a Magic mouse? Ahh, yet another step toward the “phasing out the magic mouse” direction… darn. It works both with a two-fingered double-tap or a four-fingered down movements, unfortunately only a restrict set of applications has this (E.g., Preview, VLC). Many apps never show recents like Photoshop, Chrome, Safari, iTunes, Word. Hello! This doesn´t work with Numbers on my Mac. Why?